Again, focusing on lights and shadows, using only Ivory Black and a rag. Tiny white was added as highlights at the end. 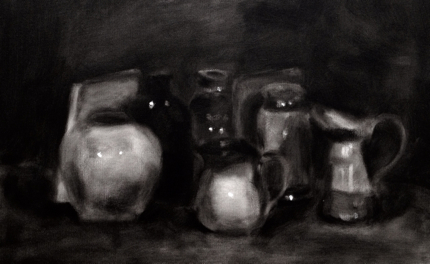 I've never done still life oil painting, so, at first, I was a bit intimidated by these jars, vase and books. I still have a bad habit of drawing, rather than seeing shapes as tones, and Greg gave me precious advice today. I'm reasonably happy with the result.